At least one bus route from South East Northumberland should serve Newcastle station rather than terminate at Haymarket. Passengers wishing to travel by public transport should be able to get to the station easily, without having to hire a taxi, be dropped off and / or picked up, or walk a long way from the nearest bus stop, possibly with heavy luggage or in bad weather. Integrating bus and train travel in this way will ease pressures on overloaded station car parks and generate more passengers for both bus and train companies. As direct bus from Northumberland to Newcastle station would assist those with luggage making longer inter-city journeys, particularly for passengers who don’t have a bus connection to Morpeth station or who are travelling at a time when inter-city services don’t stop at Morpeth. Integrated ticketing would increase use of both bus and train particularly for passengers who can’t be sure if they will return at a time a suitable train is running. This is particular important given the paucity of rail services in the evening. It would then be possible to travel to Newcastle by train and return by bus. SENRUG believes the more public transport is integrated, the more it becomes a viable option for journeys, and passenger numbers and hence revenue will increase on both trains and busses where better integration takes place. The station turning circles at Cramlington and Morpeth could be served by very minor diversions to or extensions of nearby bus routes. At Cramlington, this could be route 57 / 57A which serves Nelson Village. At Morpeth this could be route 2 (providing access to the station from Guide Post, Stobhill and Kirkhill) plus extension of routes 33 (from Lancaster Park) and 35 (from Ashington and Pegswood) from the bus station to the rail station. The scope of the North East Explorer ticket (allowing travel on bus, metro, ferry and trains between Newcastle and Sunderland only) should be extended to cover all local rail services in the region. Most train operating companies are also major bus companies. At board level, these companies say they are committed to integrated transport, though here in Northumberland that commitment seems to be lacking in practice. Train companies should be required to state what steps they will take to integrate train and bus operations when bidding for new rail franchises. Additionally, for bus routes subsidised by Northumberland County Council, the Council should amend the contract to ensure that nearby stations are served. In May 2016, a very limited bus service (route S1) was introduced at Morpeth Station bus turning circle, running to the town centre and bus station in one direction and Loansdean, Clifton and Stannington in the other. In August 2016, as there was still no bus stop or timetables at the railway station or anything to indicate the bus service exists, SENRUG displayed its own double A1 sized poster including a bus stop sign and showing the times. SENRUG hopes the railway station facility of this new bus service will be well used and other routes will start serving the railway styation as well. 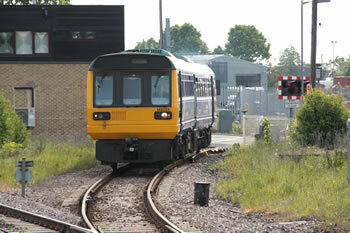 At Cramlington, SENRUG is pleased to note that its campaign to re-locate Cramlington station is now being led by Northumberland County Council, and SENRUG believes the new station site adjacent to Manor Walks Shopping Centre should be an integrated bus and railway station including taxi rank and car parking.